Gisèle Villeneuve’s new short story collection continues to win major awards. 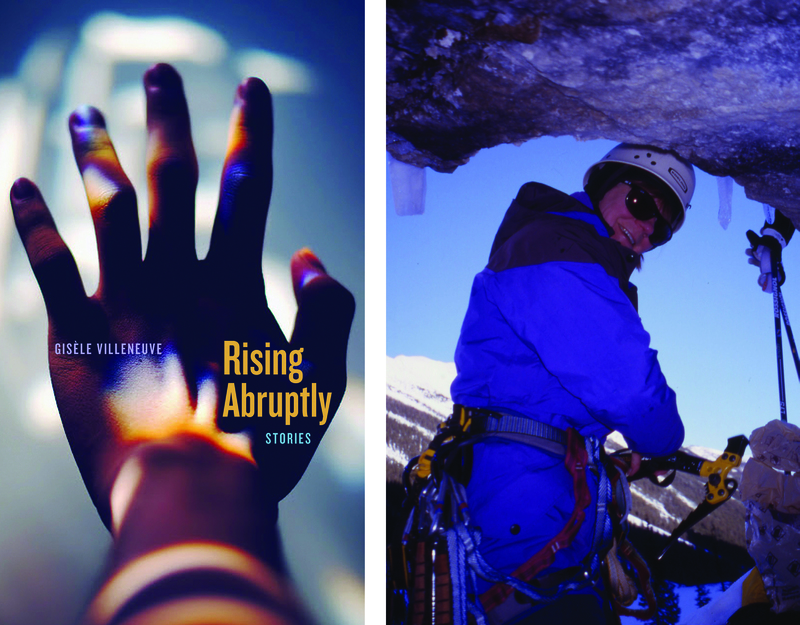 Most recently, Rising Abruptly was announced as the winner of the Mountain Fiction & Poetry category at the Banff Mountain Film and Book Festival. The book also won the Georges Bugnet Award for Fiction [Writers’ Guild of Alberta], the Trade Fiction Book of the Year [Book Publishers Association of Alberta], and was on the Alberta Readers’ Choice Award long-list. I am so pleased that Rising Abruptly is now linked in this manner with our Rockies. It’s no great revelation to say that writers are the ultimate soloists. Even if we are only climbing along the horizontal line of the page, it has its challenges and hazards. But after months, if not years, of working the problem alone, it’s a great comfort, and relief, to find a support team when we reach our summit. Meaning of course when the manuscript is accepted for publication. And so, I owe a debt of gratitude to my publisher, The University of Alberta Press, who took a chance on me, and to my editor, Maya Fowler. It can be tricky to be assigned an editor you never met before. Fortunately, in the case of Rising Abruptly, working with Maya was pure joy. Think of it like a team of two on a rope. When it works well, the moves are fluid, no movements wasted. No swearing at each other. Maya and I share the same views about writing, language, taking risks on the page. And no matter how careful you think you had been reviewing your manuscript, after all those months, or years, you get a little snow-blind staring at your words. And so, the sharp-eyed editor keeps you from hitting the stylistic deck. Afterward, if our books are nominated for awards, and actually win, we think about the jurors. In this case, Mayan, Ian, and David. I wish to acknowledge their contribution. The job often requires that the individuals serving on a jury put aside their own work to read and assess and debate and decide. Then, there are the sponsors. We know that makers of gear for the great outdoors regularly sponsor expeditions into the wild. Tonight, I’d like to pay tribute to Deuter for its support of literature, another kind of expedition into the wild of our minds. And now, I offer a heart-felt thank-you to all of you organizing and coordinating the Banff Mountain Film and Book Festival. And last, but not forgotten in this adventure, there is the mysterious, elusive person of the reader, without whom no book can have true meaning. Merci beaucoup. The organizers of The Writing Stick: Sharing Indigenous Stories welcomed over 200 people to participate in a conference dedicated to conversations about respectful ways to publish Indigenous stories. The conference took place at the University of Alberta from June 8 to 10, 2017. …blogging about our new PhD Internship in Publishing and Editing. The staff of the University of Alberta Press had a treat on Monday: a visit to the Bruce Peel Special Collections! Linda Quirk, Assistant Special Collections Librarian, and Kevin Zak, Exhibitions & Collections Assistant, spent an hour showing us a range of treasures and telling us about the general operations of the Bruce Peel Special Collections that houses and archives rare books on campus. No food and drink are allowed inside the locked doors, but we didn’t need white gloves either—just a thorough hand-washing was enough to allow us to touch some books Linda pulled out of the massive collection. But the most well-known book we viewed—and a lot more valuable than the above mentioned items—was a book by Johannes Tinctor, known as Invectives Against the Sect of Waldensians, from 1465. This “foul treatise” is the first known book that deals with how to identify and persecute witches. Its three sister manuscripts are held in Paris, Brussels, and Oxford. No wonder that it has garnered much media attention. There are countless treasures and fascinating stories to go with them at the Bruce Peel Special Collections. Check out their website for more information and to browse their digital exhibitions. Be sure to mark your calendar for future exhibits, which continue to become ever more extensive and interactive. We promise you will be fascinated!